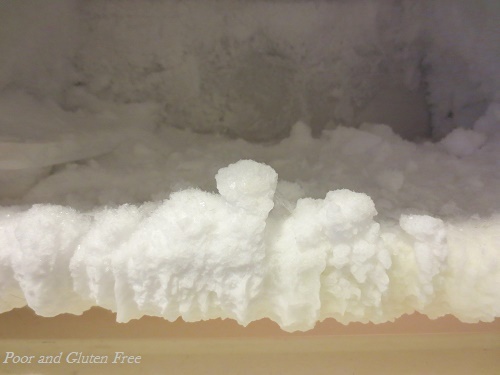 I've never wished harm on an appliance before, but I frequently wish for the death of my freezer. I might be the only person in the world left with one of those ancient fridge freezers that needs to be defrosted. My husband and I rent an apartment and the property management company won't replace the fridge until it dies. Trust me, after 1.5 years of having to defrost this freezer, I want this stupid thing to die, and yet it lives on and on. In an ironic twist, most of the people I know with new fridges have had to call for service for them time and again within the first year of ownership. Just last month we had a fiasco in which my grandmother's brand new 4 month old fridge lost it's door handle. I guess this is proof that they don't make things the way they used to! Regardless, over the last year and a bit I've come to learn that the best way to clean my icy fridge freezer is the one that causes me the least stress and least amount of manual labour. So in the off-chance you, like me, suffer with a fridge that's older than time, read on and I'll tell you how to clean it! Along with what NOT to do. The least stressful way to deal with this (and the least damaging to the freezer), is to keep pots and boils of boiling water inside. Place a couple of pots inside, close the door, and let it sit for 10-15 minutes, until the water is lukewarm to touch. Repeat with a fresh set of boiling water. I usually use one large pot and one small pot heated on the stove, and then alternate with one large and one small bowl that I heat in the microwave. This process will take a while, depending on how much ice has grown. The last time I did it, it took me about an hour. However, because I just used the boiling water and didn't muck about with a hair dryer, I was able to walk away for several minutes at a time and do other things, like laundry, etc. The last time I defrosted my freezer there was quite a lot of ice. I threw the chunks in the sink to let them melt. 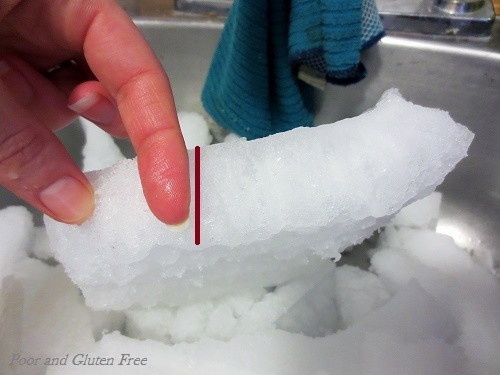 This was a chunk that came off the underside of my freezer, at least an inch thick. So yeah, it was time to defrost that baby all right! Phew, after a few puddles of water and some chilly fingers, it's all done. * Do remove everything from the freezer. 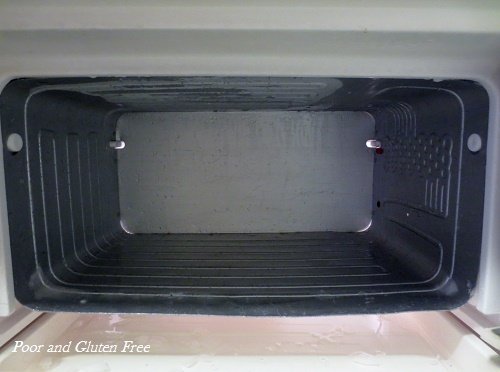 Put food, etc, in a cooler or in the fridge to prevent defrosting. 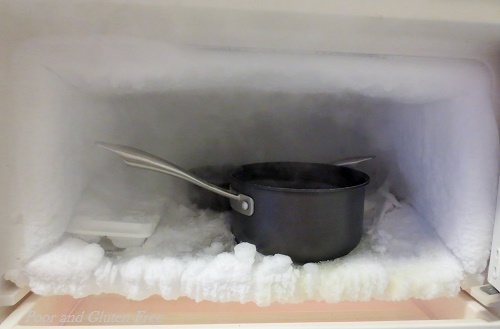 * Do lay a large towel over the top shelf of food in the fridge to catch drips from the freezer as it defrosts. 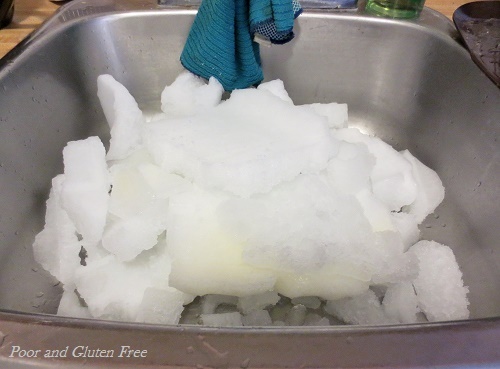 * Lay an old towel or rag on the ground in front of the fridge to catch more drips as you transfer chunks of ice from the freezer to sink, etc. * Don't stab at the ice with a knife, no matter how much you might want your freezer to die. You could hit wires and hurt yourself and your fridge. Electrocution is never fun. * If using a hair dryer, be very careful of water drips and puddles. Again, electrocution is never fun. * Do as I say, not as I do, and avoid using a knife to pry chunks of ice off when you're sure it's almost ready to come off. Because again, electrocution is never fun. * Wine, music, and chocolate - sip, bite, dance, and make merry while the pots are melting your ice. *** Do not operate electrical devices near water while drinking wine and dancing. Electrocution is never fun. 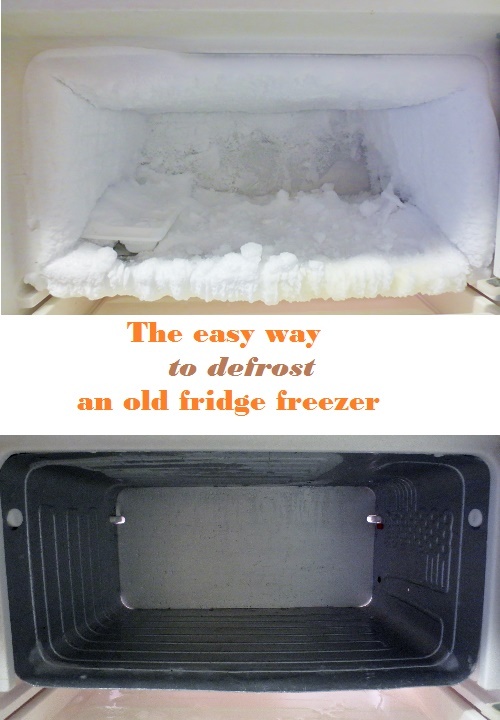 Have you ever had to defrost an old freezer? Do you have any icy horror stories?